USDJPY is under the influence of Prelim Machine Tool Orders y/y, M2 Money Stock y/y, and Core Machinery Orders m/m in Japan and the 30-y Bond Auction, Natural Gas Storage, Wholesale Inventories m/m, and Unemployment Claims. Since 7th of June this pair has been moving with bearish bias. 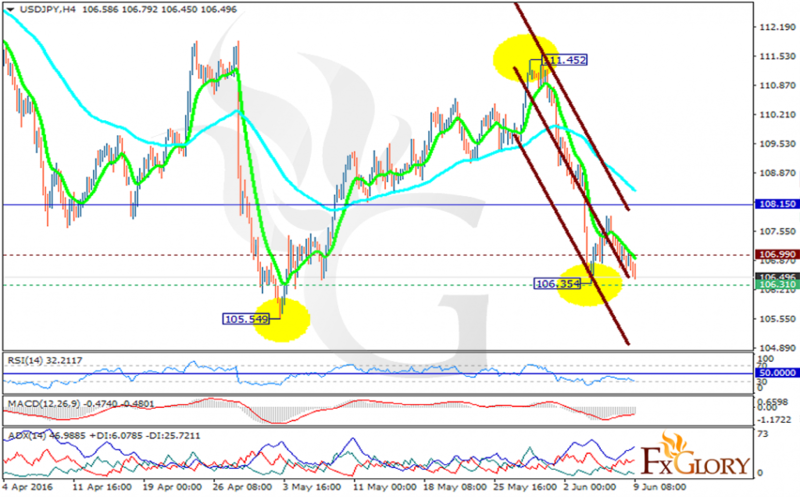 The support lies at 106.310 with resistance at 106.990 which both lines are below the weekly pivot point at 108.150. The EMA of 10 is located below the EMA of 75 and is falling down the descendant channel as well. All indicators are signaling price decline; the RSI is below the neutral zone getting close to the oversold area, the MACD indicator is in negative territory and the ADX is showing strong sellers. The support level breakthrough will pave the way for further decline targeting 106.00.